A new population of seniors and those nearing the senior status are looking for some type of financial means to pay for long–term care (eldercare) in case of failing health. Many have taken care of family members who had no means to pay for their care or have seen their parents entire retirement savings wiped out because of medical and nursing home costs. Does the government Medicare program pay for eldercare costs? A statement on the Medicare.gov website clarifies what Medicare will pay for. “Generally, Medicare doesn’t pay for long-term care. Medicare pays only for medically necessary skilled nursing facility or home health care. However, you must meet certain conditions for Medicare to pay for these types of care. Most long-term care is to assist people with support services such as activities of daily living like dressing, bathing, and using the bathroom. Medicare doesn’t pay for this type of care called “assistive care”. Assistive care (non-skilled care) is care that helps you with activities of daily living. How does Medicaid cover long–term care costs? Fortunately, there is a government program that will help pay for long–term care costs – Medicaid. Unfortunately, this program is unfairly discriminatory and will only pay for care for individuals who have less than $1,500 to $2,000 in assets (and in about 22 states, the program will only cover individuals who fall below a certain income threshold). All other individuals wanting help from Medicaid must impoverish themselves paying for their own eldercare services first, before Medicaid will help them. Planning for the final years of life and dovetailing government programs, care provider systems and funding sources can be invaluable yet complicated. This area of planning can be one of the most challenging endeavors undertaken by anyone attempting to help seniors in this final phase of life. The National Care Planning Council has introduced a new long–term care planning tool called “Guide to Long Term Care Planning”. It is impossible to predict what your future eldercare needs will be. 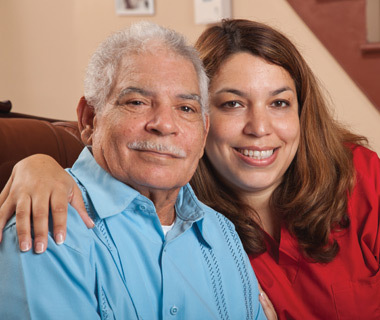 You cannot determine in advance if you will need home care, assisted living or even nursing home care, but you can have a plan in place that will provide the financial, legal and family support as well as protecting your assets, no matter what happens. The goal of Care Resource Planning is to provide strategies and solutions pertaining to any or all of the items outlined below that may be unique to the client's situation. With the help of trained professionals who understand all of the issues pertaining to eldercare, a plan can be prepared to protect assets, locate appropriate funding and provide the necessary support to ease the burden for the final years of life. For information on BAYADA eldercare services, contact us, we are happy to answer all of your questions.